It is usually assumed in MINLP algorithms that objective and constraint functions are continuously differentiable. In addition problems considered in Nonsmooth optimization are typically continuous. Consequently there are only a few, if any, algorithms for nonsmooth MINLP problems. The goal of my research is to generalize ECP method to handle also nonsmooth MINLP problems. The ECP method has been proved to converge to a global optimum, when the objective function and the constraint functions are continuously differentiable convex functions . We have proved the convergence of the ECP method when the functions are allowed to be nonsmooth convex functions. The only modification that needed to be done to the algorithm was to replace gradients by subgradients of the convex function. Further studies include generalizing αECP (presented in e.g. ) method for nonsmooth functions. (1) Westerlund, T., and Petterson, F. An extended cutting plane method for solving convex MINLP problems. Computers and Chemical Engineering 19, 11 (1995), 131-136. (2) T. Westerlund, H. Skrifvars, I. Harjunkoski, R. Pörn, An extended cutting plane method for solving a class of non-convex MINLP problems. Computers and Chemical Engineering 22(3), 357-365, 1998. 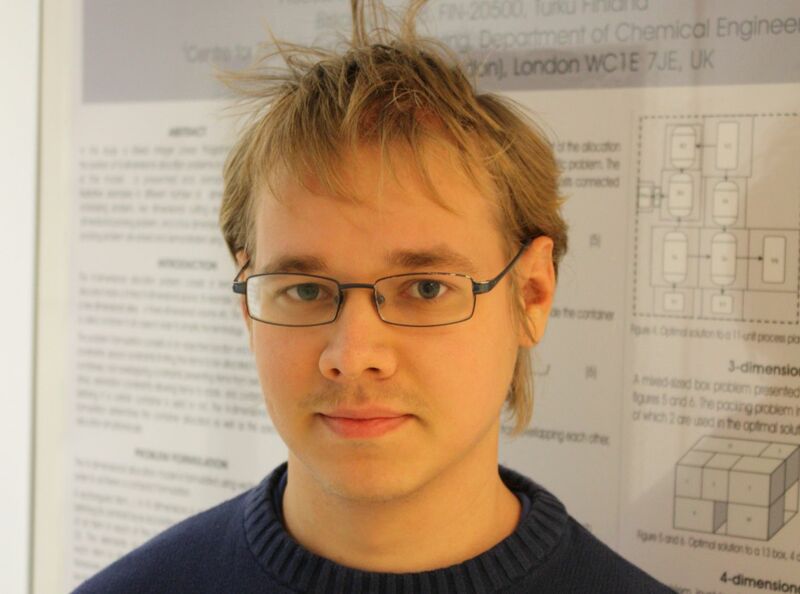 Ville-Pekka Eronen is currently a Master's student at University of Turku. He is collaborating with professor Tapio Westerlund on extending the ECP algorithm to nonsmooth cases.